Good times in the skies are wanting to happen, you have upgraded your basic 3 inch refractor to a bigger, heavier Cassegrain type scope with extra bits so you can see more and maybe even hook up your DSLR to it and try your hand at Astrophotography. First thing you have done is attempt to put it on the old scopes mount but the old mount is groaning under the weight of just the new OTA, First comes the extreme disappointment of its not going to work and ive just wasted $xxxx , then comes bewilderment of what to do now. Well all is not lost, you havent wasted any money, but unfortunately, you will need to spend more. There are lots of options out there that will mount your new OTA and lots of other extras. How do you choose from all the options out there… I hear you ask. There are a few things to ask yourself when you look for a new mount. First one question and one of the most important ones is how much weight are you going to put on the mount. To answer this, get the weight of your OTA, then the weight of all the accessories you are going to put on the scope. When working this out, also think about any accessories you may purchase in the future too. This is important as a mount that has minimal weight capacity over and above your current setup will struggle to support what you have let alone anything else you purchase. Load Weights/Capacity these days is extremely important, as many mounts are motor driven/guided, and too much weight can strain the motors and drive gears and cause burnouts and other problems. That little setup weighs in at around 25kg+ (60lbs roughly) so quite a few mounts are instantly out the window, it leaves only a few mounts like a Paramount or Sky-watcher’s new EQ8 that have the ability to carry that set up and more if you add a camera rig to it. 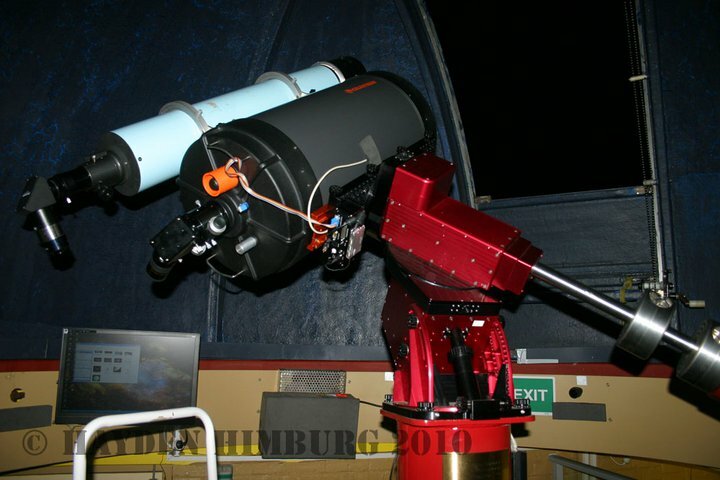 This sort of setup would also generally be a permanently mounted Observatory(like the pic above), so moving it around is not an issue. But if its a smaller scope of say a 10 inch Schmidt-Cassegrain with a 2 inch diagonal and eyepiece combo or Small DSLR camera setup that gets stored inside then moved out onto the patio/driveway and weighs around 15-20kg (45lbs) then there is a lot more choice in mounts. 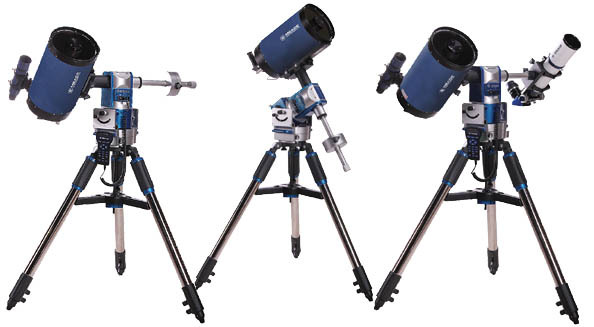 Companies such as Skywatcher, Meade, Celestron, iOptron, Losmandy all make mounts that are more portable and are still fully featured but will handle such a telescope setup. Skywatcher make the very excellent EQ-6 Pro, this German Equatorial mount is driven but also guided via the Synscan hand controller or via computer software from a laptop or computer so you can program the mount with date/time/location and if correctly entered the mount will find the celestial pole in your hemisphere and away you go, enter the object you want to view, and the mount will automatically drive to it and then track it so it stays in the eyepiece. 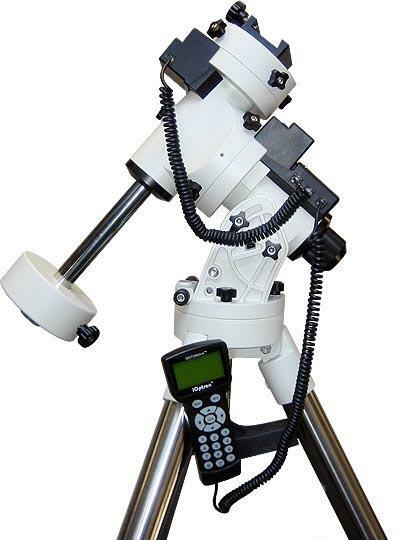 These GOTO mounts are very popular, Meade, Celestron, Losmandy, iOptron and Skywatcher all make these GOTO mounts, Many are now starting to come out with GPS built in, to really help refine your location details for even more accurate pointing and tracking. The last couple of years has seen some innovation in Mount design, Meade released the LX80 mount which can be used as an Equatorial Mount, an Alt-Zumith mount or a dual AZ mount, and it is a full GOTO mount in all 3 modes, and has a pretty good load capacity as well with a 40lb capacity in AZ or EQ, and in Dual OTA setup a 70lb capacity. Skywatcher have recently released the AZEQ6 Pro that has a 20kg load capacity and can be used in EQ or Dual AZ mounts like the LX80. Ok, so most of the new mounts are not cheap, with pricing starting at around $2000 NZ dollars, they represent a big cost, but if you have gone and spent that much and more on a high quality OTA and accessories, why cheap out and put them on a weak and over stressed mount?